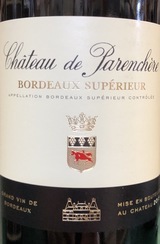 An intense ruby color, the Château de Parenchère Bordeaux Supérieur is full and fleshy with a strong underlying structure. It displays intense red fruit aromas of cassis and black cherry with elegantly soft tannins. There is a great balance between the ripe fruit expression and the wine's freshness. Food Pairings: Perfect with grilled tenderloin and garlic potatoes. The wine is balanced: it is firm with tannins and rich with berry fruits. It has a fine structure that will stand it in good stead as it matures. Drink from 2019.